The Social Mobility Commission is dead. So what does this mean for the impacts arising from the social sciences research that informed its reports? Alan Milburn’s resignation from the Social Mobility Commission likely spells the end for the body that has come to be seen as an exemplar for the use of research evidence in public policy debate. But what happens to the REF potential of the social sciences research that has been cited in the commission’s reports? Can REF panels ignore the fact the commission has failed in its objectives? To David Walker, this example highlights how policy remains largely uninflected by academic research findings; an uncomfortable truth for the arbiters of research impact who continue to insist there are linear relationships between knowledge and action. The Social Mobility Commission is an odd body. Created in the dying days of the Gordon Brown government, it was exhumed by the Cameron coalition. Nick Clegg claims he administered the kiss of life, but in doing so extinguished the words “child poverty” from its Labour title. Alan Milburn, a former Labour minister – albeit one strongly in favour of private markets – was made chair and one-nation Tory Gillian Shepherd his deputy. As a statutory body giving robust public advice on a politically sensitive subject, it has parallels elsewhere in Europe but has been distinct in the UK. As an exemplar of using research evidence, too, it has stood out, with a social science professor – Paul Gregg of Bath University – sitting alongside Milburn and Shepherd as a commissioner. Commission reports mixed and matched longitudinal studies with data from the Office of National Statistics, analysis by the Resolution Foundation, and the Institute for Fiscal Studies. They have been a goldmine for academic researchers looking for citations. REF 2021 will see the following syllogism deployed: Cameron and after him Theresa May used the words “social mobility” copiously; commission reports made reference to cohort studies and similar; ergo social science work has had impact. 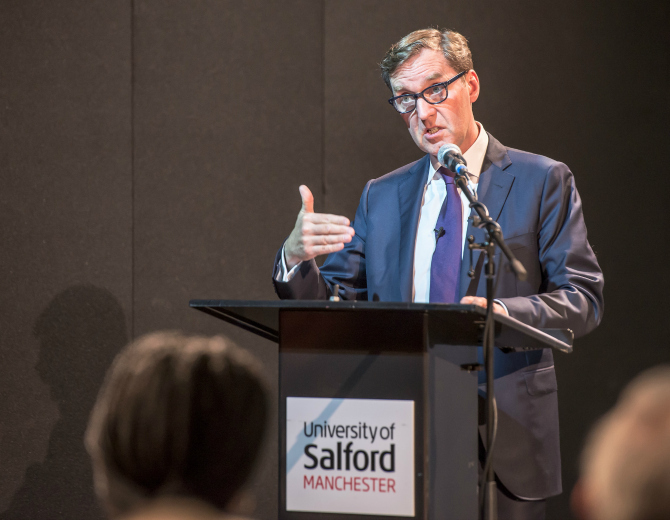 Image credit: Alan Milburn calls for action on social mobility at Salford Lecture series by University of Salford Press Office. This work is licensed under a CC BY 2.0 license. Not quite. The Milburn commission used a loose and all-inclusive notion of social mobility, embracing relative poverty, access to higher education and well-paid jobs, spatial concentration of disadvantage, and the permanent historical success of the British elite to defend its sons and daughters against the social drop. Synonymous with persistent inequality, social immobility is clearly a British national characteristic, which a large wedge of politics is about preserving. Whether mobility rates, rigorously defined in terms of relative chances of rising and falling between social classes, have changed much is questionable, and John Goldthorpe, Geoff Payne and others have intensely questioned those claiming (bad) things have got much worse. But the appetite for impact is gargantuan and scholarly argument has not been allowed to weaken the contention that the commission shows how social science observation of British society through time has been taken up by policymakers. The trouble is that the policy process is not just serpentine, but has dead ends. The Social Mobility Commission turns out to be unheeded. Impact stops with it. Milburn has just announced he is resigning. Part of his justification can’t be contradicted. Ministers and Whitehall civil servants are fixated on Brexit and have neither the time nor energy for much else, especially problems as obdurate as elite privilege and social disadvantage. But his claim that the government has “given up on making Britain fairer” assumes a few windy speeches by Cameron and May and intermittent and largely self-contradictory statements by the education secretary constitute a policy intention, in the face of simultaneous policymaking (by the Treasury and Department for Work and Pensions) on welfare, benefits, and taxation, which goes the opposite direction. The May government, to save face, may seek a successor to Milburn but the Social Mobility Commission is dead. The resulting problems for impact are several. By Milburn’s own admission the commission failed. The trajectory of inequality is arguable, especially whether we properly measure the income and wealth of the top 1 per cent, or at all. But even those who believe that inequality has flatlined since the 2008 recession would not attribute any weight to the policies, fiscal or social, adopted by the Cameron and May governments. As for improving the life chances of those at the bottom of the heap, the commission’s successive reports deny it. So those who contributed evidence to the commission have also failed – failed to have impact on policy, let alone on socioeconomic conditions. Of course that is not social scientists’ fault. Perhaps the very existence of the commission has had influence on the “climate of opinion”, but that claim needs evidence and is hard to model. So will REF 2021 dole out its brownie points in innocent retrospection, ignoring the arc of the Social Mobility Commission’s significance to ministers? Longitudinal studies consistently affirm the persistence of inequalities. Socioeconomic conditions before, during, and in the years after birth have huge causal significance for life chances at the cohort level. That reliable social science story, evidence-rich, was picked up by the Milburn commission and repeated in its state-of-the-nation reports; what else could it do? That seems to be as far as impact goes: banging on a drum which many others – interest groups, advocates, political parties, think tanks – are also playing. But the drum does not resound in the hearing of those making tax and spend decisions, or if it does, they are deaf and continue with partisan commitments. Policy has largely been uninflected by this advisory body, or the social science findings. For anyone in, around, or observing politics in the decade of austerity and Tory dominance that is a banal conclusion yet it’s also one the arbiters of research impact consistently ignore as they continue to insist there are linear relationships between knowledge and action and that impact can be assessed non-normatively. David Walker is the author, with Polly Toynbee, of Dismembered: How the Attack on the State Harms Us All, recently published by Faber and is a former member of the ESRC council.